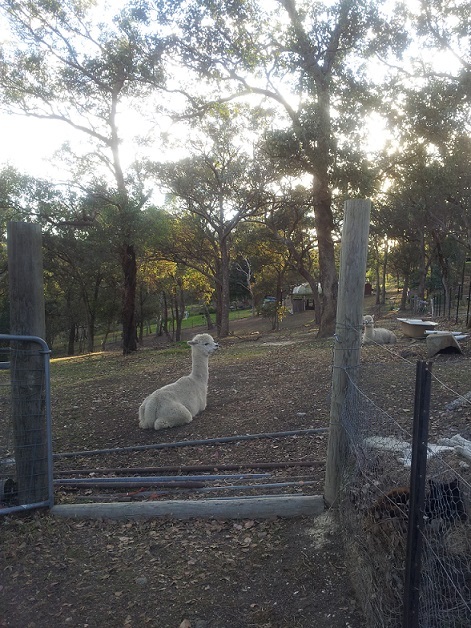 In the wetter years since 2009, I had to get the grass cut before Christmas because the alpacas couldn’t keep up. This year we’ve had to start supplementary feeding early because the alpacas have mowed the grass down already. In this first photo, I’m standing in my paddock, taking a photo of my neighbours’ paddocks. The three of us share the four alpacas. This next photo shows a small, fenced off area [roughly 2 metres by 3] that used to be one of the alpacas’ favourite poop spots. Once they start using a spot they become very attached to it, and refuse to stop pooping there. Unfortunately, this particular spot is really close to both the pool and the house, and the odd, gentle breeze can bring tears to your eyes. I’ve been trying to get rid of this spot for years, without much success. 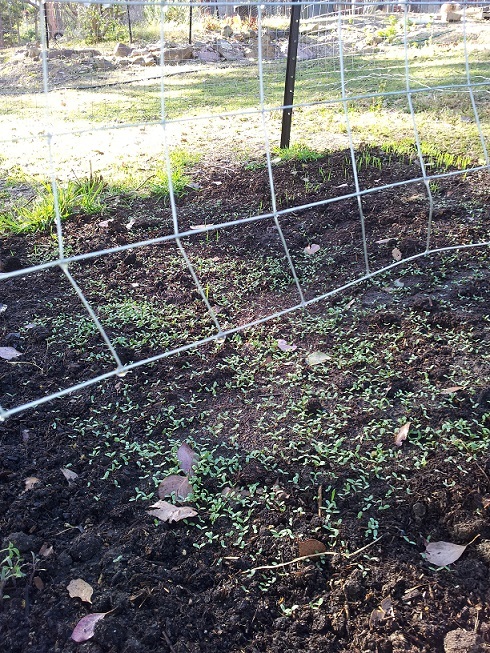 My latest plan has been to dig up the poop [and put it on the compost], dig up the soil underneath [to get rid of their scent], replace it with mushroom compost and plant something they love to eat [Lucerne]. Fingers crossed it works this time. 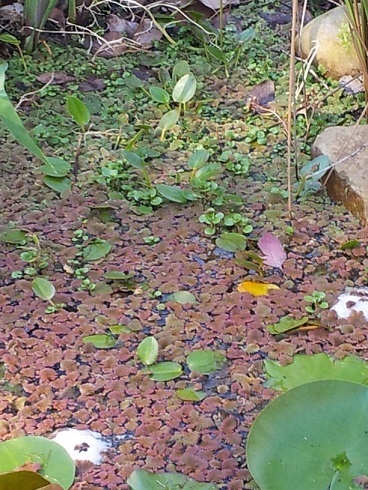 One area where I have had some success is with my ornamental ponds. One is less than a metre long, and the other is about 2.5 metres long, so both are quite small but the local frogs love them! This next photo is of the larger pond and shows clusters of strange, white bubbles in amongst the water lilies and duck weed. Those, my friends, are frog eggs! I don’t really know why the frogs like my pond so much, but I’m thrilled that they do. It contains water cress and a host of other water plants so maybe I got the mix right without knowing it. This entry was posted on Sunday, December 14th, 2014 at 9:57 pm	and tagged with alpacas, dry, eggs, frogs, lucerne, pics, pond, Warrandyte and posted in Australia, Uncategorized. You can follow any responses to this entry through the RSS 2.0 feed. Lovely photos! Especially the alpacas 🙂 Your place looks heavenly. Really glad to see the frogs are doing well…they’re usually the first to let us know if things aren’t right in the natural world. Thanks 🙂 And yes, it’s reassuring to know the frogs here. We’re not completely spray free, but we’re close and I suspect that helps. I remember “meeting” you first via your posts about alpaca poop. 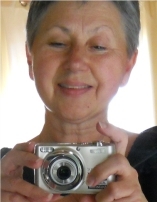 Welcome Jo-Anne! We do get the alpacas shorn once a year but their fleece is very vin ordinaire. Basically we just got them to mow the grass as we have close to 4 acres between us. Have you used alpaca yarn? I’ve heard it’s meant to be beautiful to knit with. What a great idea sharing alpacas – we just share a cat! Even dry Warrandyte still looks lovely, and those frogs have four star accommodation. Wonderful that you can grow cress, we -even the G.O.- love the stuff. A pond is definitely on our one-day list, we already have frogs! TA has been the dry also, last week’s rain is the first time the tanks gave been full since very early in the year. The sharing thing began because one of my neighbours had a horse and asked if he could agist Rusty on our paddocks. When Rusty went to the farm we were so used to having a 4-legged lawn mower that we all chipped in for the alpacas. I also have a fav … spot… ANYWAY! Instead of just “fixing” the spot, why not move the soiled soil to some place else? Instead of just letting them pick a new spot. Sort of guide them to a new place by their own scent. They already have other spots George. 😦 Honestly don’t know what the psychology of it is. I think though that its and evolutionary thing because they won’t eat the grass growing around their poop spots so they end up becoming like fertilized crop rotation areas! Your place looks like a park. What amazing surroundings. Hope you get the rain you need. A rant theme? -giggles- I could use one of those right now! Well at least the post looked fine in the final cut. 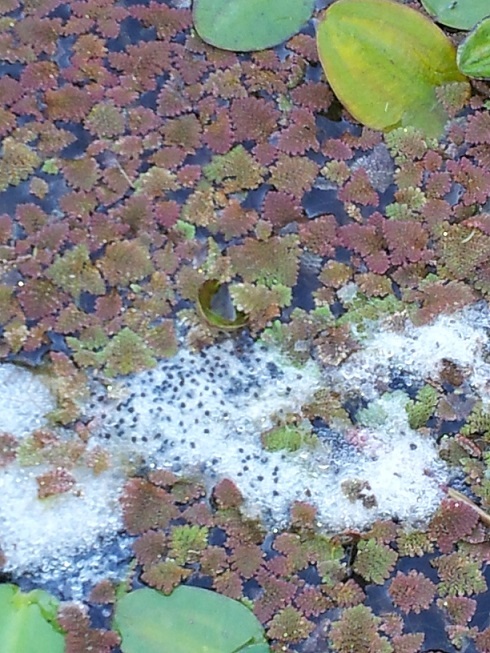 That;s a ,lot of frogspawn you have there, the blighters will be all over the place. Thanks. 😀 It is quite beautiful here but we pay for it during fire season. No free lunches I guess. Good luck with the “poop pad”. lol I had no idea alpacas were so sanitary. It’s quite amazing, really. I know penned rabbits choose a spot, too, but I don’t see that in the wild.